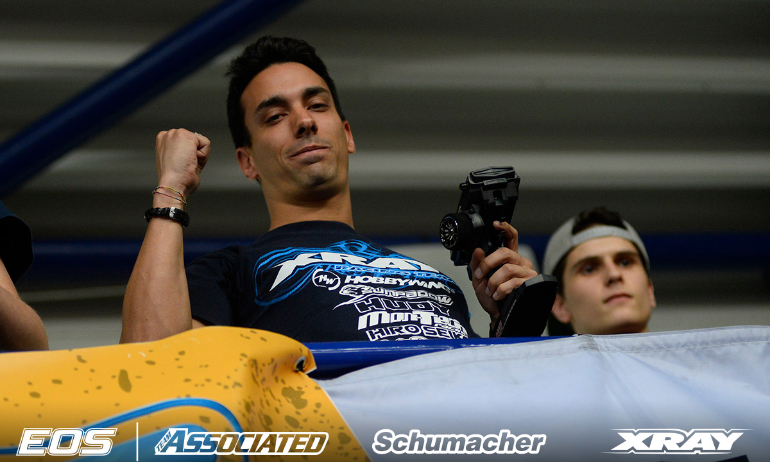 Bruno Coelho has won 4WD at the fourth round of the Euro Offroad Series in Slovakia. 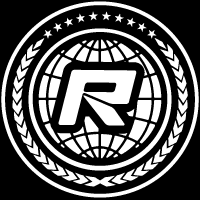 Having concluded the first half of the season last month in Daun with the first win of his campaign, the Xray driver today opened the second half of the season with victory when he wrapped things up in A2. 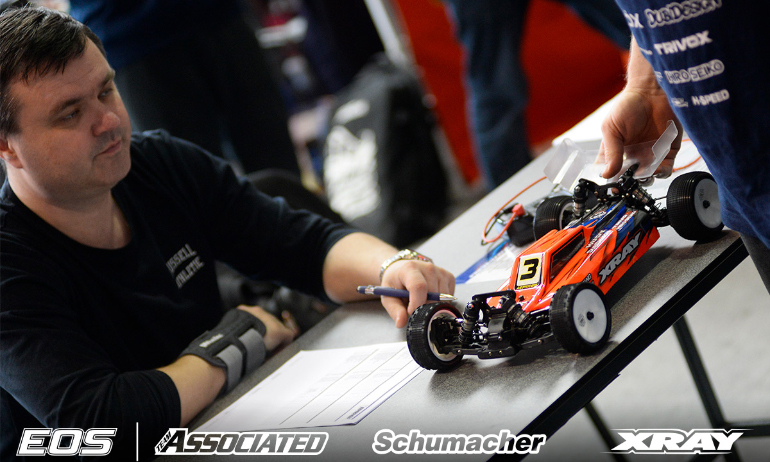 Similar to A1, Coelho’s only challenger would be Michal Orlowski but this time the Schumacher driver came undone on his own when he got it wrong at the table top on lap 3. Dropping down the order, he would eventually pull off as team-mate Joern Neumann took advantage of other’s mistakes to finish second, 6-seconds down on Coelho. 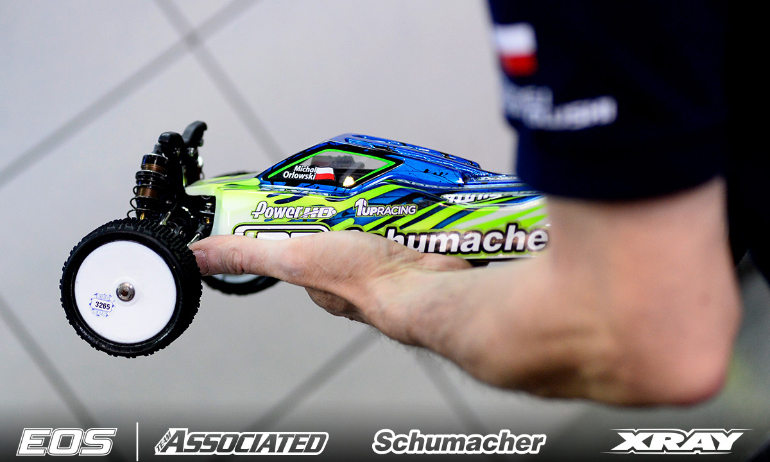 With the prospect of a repeat of the double win he took at the Hudy Arena last year gone, Michal would manage to win A3 which would with his P4 from A1 at least see the reigning champion make the podium in 3rd place. Having to defend greatly finishing A3 in second just ahead of Joona Haatanen and Jörn Neumann, it would be Martin Bayer who would claim the second step on the podium for an Xray 1-2. Neumann ended the event in 4th position ahead of Haatanen and with Lee Martin completing the Top 6. Reacting to his A2 win, Coelho said, ‘I had a fight with Orlowski for the first two laps but then he made a mistake at the table top and that gave me space to breath and I pulled away slowly’. 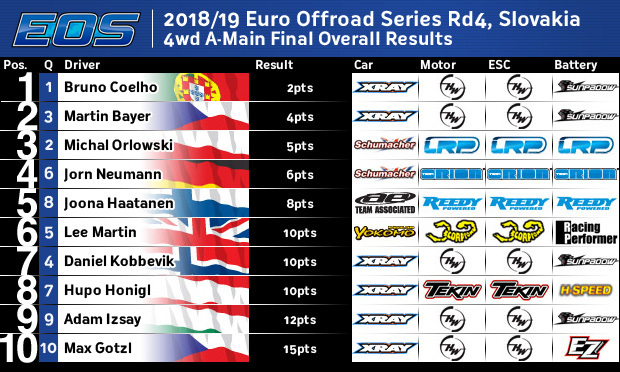 His 10th EOS 4WD career win, moving him to within 1 win off the championship’s most winning driver Neumann, the Season #6 champion was happy with his full points all from today but aired caution about the rest of the championship in terms of battling for the title. ‘We got the win today but time has started to work hard for the next EOS because it is on astro. I have not practiced on astro since the last EOS race last season’. He continued, ‘I really have little experience of it and last year we struggled so we have a lot to do and need to work on finding a set-up for astro. The season is still open’. 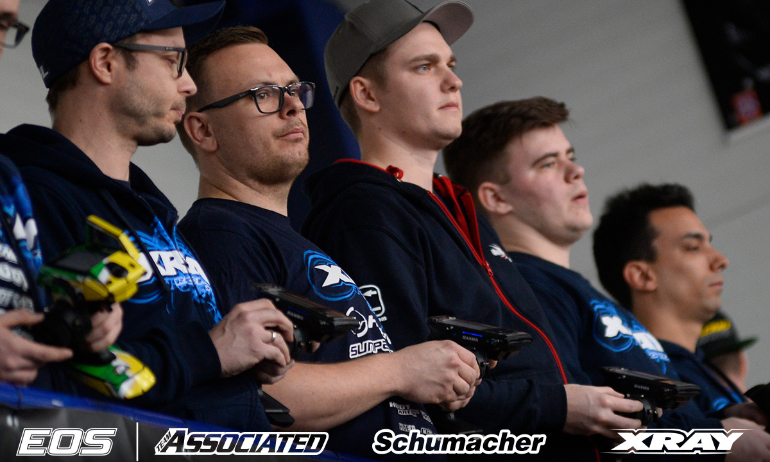 With just a single round on Astro last year at Arena 33 in Germany, host of the next round, this proved tough for Coelho. While he qualified 3rd he came away with 10th in the final. This year the extended 6 round championship included a trip to ERT Steyregg in Austria for the season finale with this also an astro surface track. ‘A defending race’, was Bayer’s reaction after the closing final. 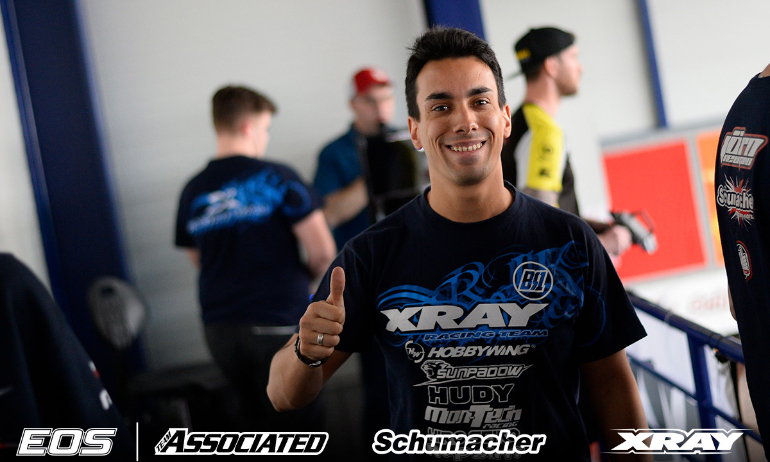 Missing out on the podium last year having started his home race from the TQ, the Xray designer said, ‘I felt I was not driving like I should but I was defending my starting place and got 2nd overall which is a good result for the the team so I am happy for this’. Summing up his finals Orlowski said, ‘At least I made the podium. Bruno deserved to win this weekend’. 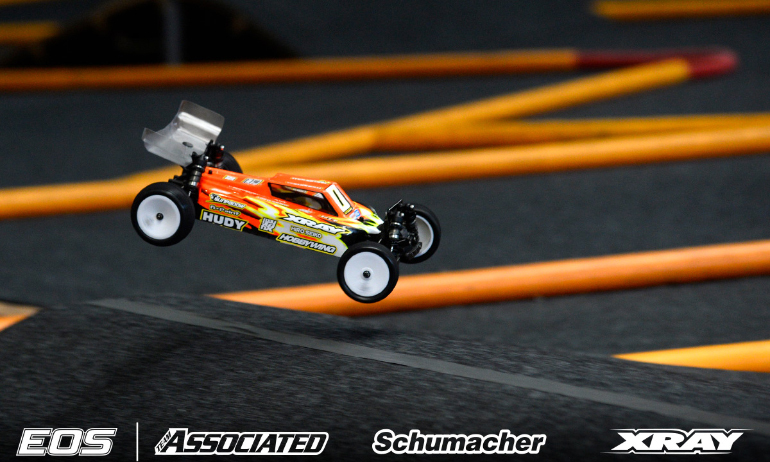 Last year’s double winner in Xray’s backyard, the Pole continued, ‘the car felt great at the start of 4WD but after Q3 I wasn’t feeling good with it’. He explained, ‘In A2 I had the same issue as in Q3. I’m not sure if it was the car or me but nothing felt good for me and I made a lot of mistakes. 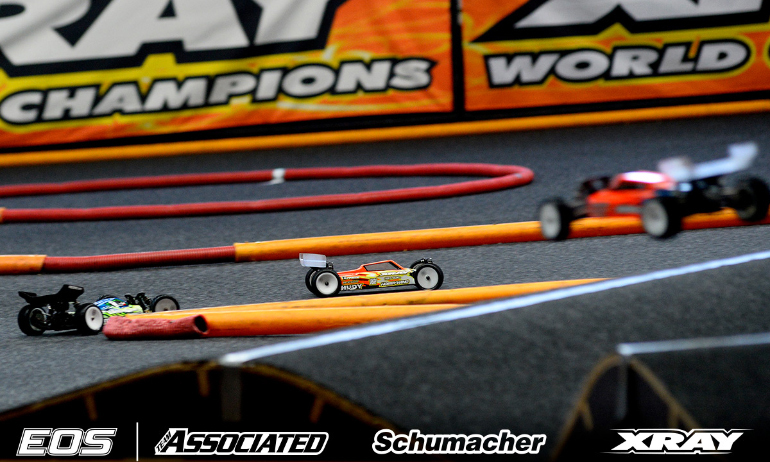 We always knew it was going to be hard to beat Xray at their test track but we are still alive in both Championships and the next round is astro turf which I feel very confident racing on. Last year Xray struggled. I’m sure they will prepare more this time but I still think we will have a small advantage’. 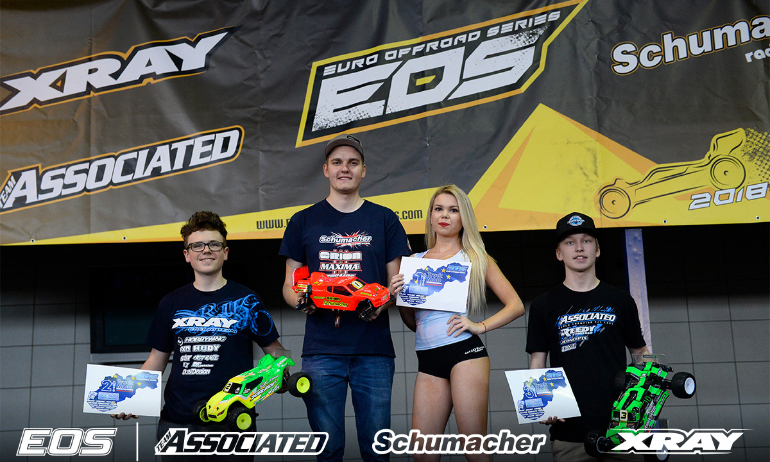 In the Mod Stadium truck class, Neumann would take both the TQ and win ahead of EOS Daun winner Max Götzl with Joona Haatanen completing the podium. 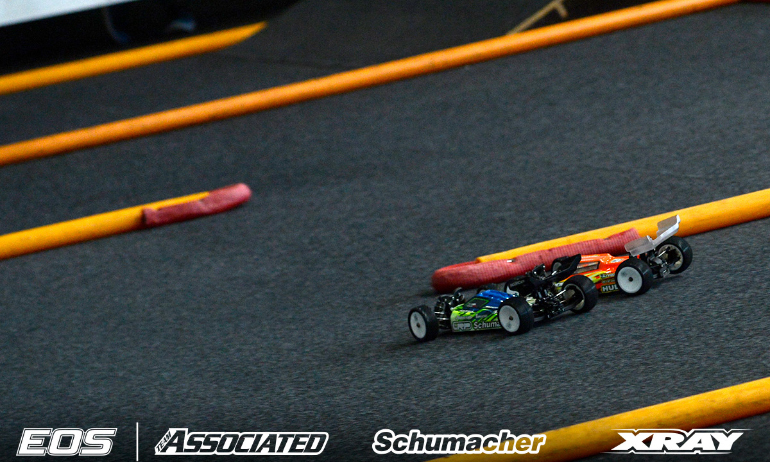 In the new for Season #8 4WD 10.5 class, the win went to Tim Kunz ahead of Jan Zalewski and 2WD 13.5 class winner Pawel Ntkovca. 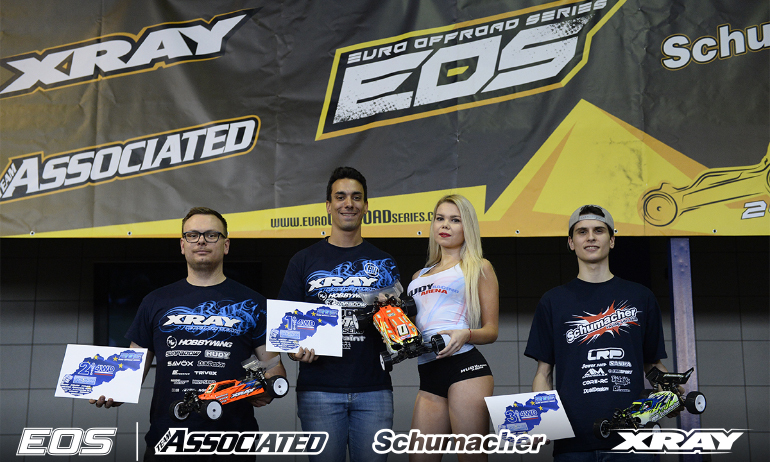 Bruno Coelho took an easy and comfortable win in the opening A-Main of 4WD at EOS Slovakia, the Xray driver leading his team-mate Martin Bayer, Lee Martin and Michal Orlowski. 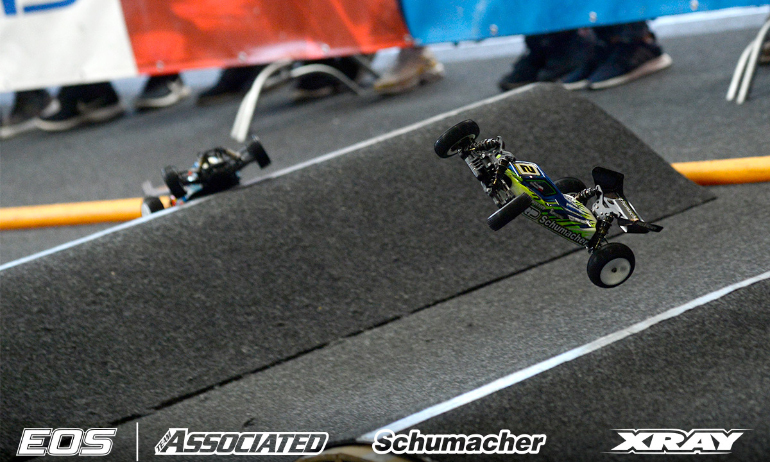 Starting from the TQ, the first lap saw a bobble from Coelho who went wide as he got up on two wheels allowing Orlowski to the front but it was short lived. Under pressure from Coelho, the Schumacher driver make a number errors leading to him touching the piping, and trying to get back on to the racing line there was contact with the Pole fairing off worst as his car flipped and needed to be marshalled. From there, already with gap over the chasing pack, Coelho opened up the lead lap after lap ahead of Daniel Kobbevik until the Norwegian made a mistake with just 3-laps to go. This allowed Bayer back up to second but he had Martin and a recovering Orlowski right behind. Orlowski got by Martin but handed it back again with a mistake on the final jump as he attempted a final pass to get by Bayer. Commenting on his A1 win, Coelho said, ‘On the first lap I got on two wheels and went wide trying to save it and this let Orlowski go by but I came straight back at him and put pressure on him and he started to make a few mistakes. He touched the pipe and ended up on the outside and I had the inside but for the next corner he would have the inside but he tried to come back on the line and we touched. I think it was just bad luck for him or maybe good luck for me’. He continued, ‘my car was very good and I did not have to force to make good laps’. The only driver to run a 21-second lap looking to A2 he said, ‘I’ll try to not let him by this time on the first lap and the car I will leave the same’. Asked about the contact with Coelho, Orlowski said, ‘the race started good. Bruno made a small mistake and I got by but then I hit the pipe and when I went back to the racing line we touched. It’s always different when you are racing and when you see it from the outside but I think it was OK. I’ll have to watch the video’. He concluded, ‘I’ll just put new tyres on for the next one and race it again’. Reacting to his Q4 time, which was 1.9-seconds quickest than Orlowski’s best time set in Q2, Coelho said, ‘That was better than expected given I was on new tyres. As I explained before our car is aggressive on new tyres so I started off very slow and even still I was on two wheels 2 or 3 times. Michal was making a few mistakes in front so I was catching him and then the car started to get better and better. At the end everything went perfect and we managed the TQ’. Looking to the finals, the EOS Daun winner said, ‘Orlowski is strong and is going to force a lot. Our pace is similar so I will try to defend my position’. 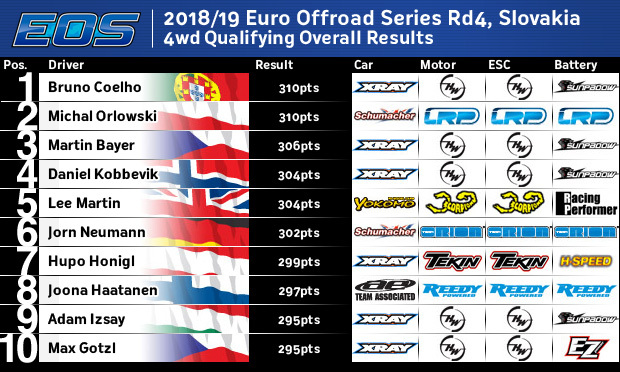 Commenting on this final qualifier, Orlowski, who won here last year from second on the grid, said, ‘After Q3 we found a small problem on the car with the shock which was probably caused by a crash I had in the warm-up. With that fixed I went with new tyres. 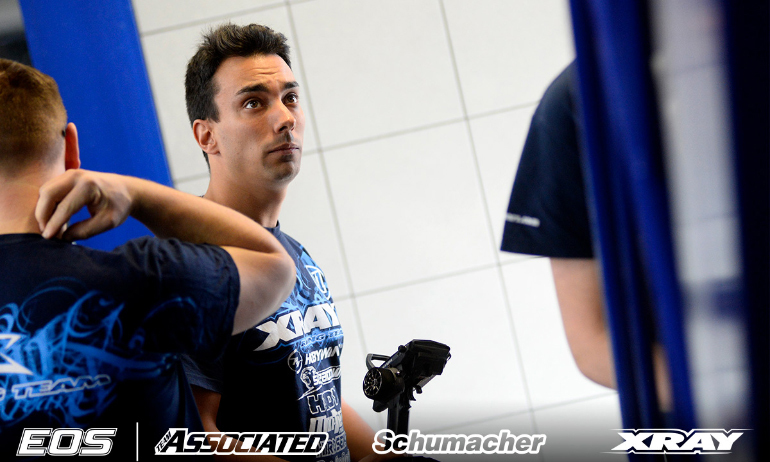 The car didn’t feel as good as yesterday so we will refresh everything for the finals’. Looking to those finals he continued, ‘I will try to keep up with Bruno and put pressure on him and see how it goes. We are a little quicker than the rest so we should be able to break away which will make it easier to fight for the win’. Bayer was pleased to be quickest behind Coelho and Orlowski and is confident he can fight to join them on the podium. On Q4 he said, ‘I was breaking in my tyres for the final because for me new tyres are very aggressive’. A former double winner at his team’s home track, the Czech continued, ‘I feel I have good pace in the second group and I can fight for 3rd. I have the best starting position for that, it will be a good fight’. 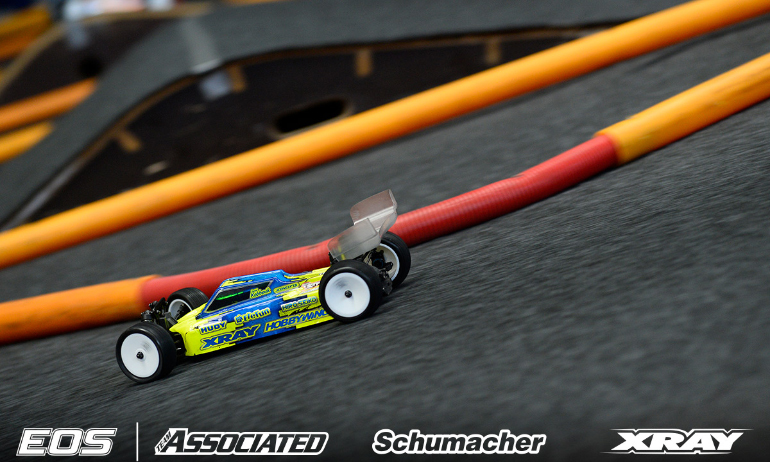 Having enjoyed a podium double at the previous EOS encounter in Germany last month, Kobbevik was happy to secure fourth with a strong P2 finish to qualifying. The Norwegian teenager explained, ‘we made the car more the same as Bruno’s set-up and it was good. Before it was super easy to drive but not fast’. He concluded, ‘I have a good car for the final and I will try to stay clean as usual’.